What would they make of their old manor if The Krays were alive today? Back in the day Travis Flood was a big shot who led the East End London gangs with equal measures of respect and fear. Fast forward to the present day and Flood revisits his old turf to discover that the area is now “ruled” by a gang of “gangsta” teenage girls which run in a pack like feral dogs. 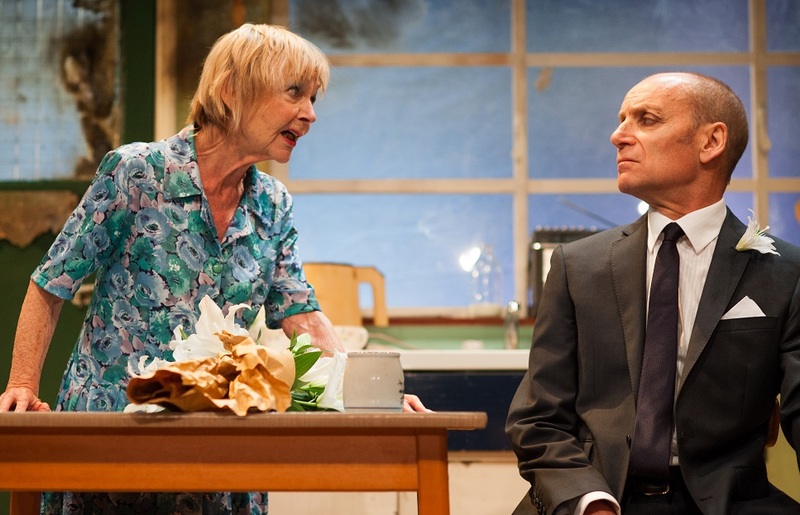 So far so good for Philip Ridley’s disturbing and darkly humorous Ghost From A Perfect Place which opened in the East End’s Arcola Theatre last night. But it all becomes rather tedious after such a promising start. The first act is pretty much given over to a bizarre conversation between Michael Feast’s “businessman” (“I was not a gangster. I offered a service,” he protests) and eccentric pensioner Torchie Sparks (Sheila Reid). Flood is taking a trip down memory lane and that includes a visit to Sparks and her granddaughter “Baby Rio” who is now, it turns out, the local gang leader. Over tea and biscuits the former tough guy learns what happened to Rio’s teen mum and Torchie’s brain damaged husband. But there’s still time to re-live old times, when the dapper Flood, who dressed in sharp Savile Row silk suits, demanded protection from people like the simple Torchie and her husband. To her life under Flood’s rule in Bethnal Green was idyllic. Everything is rose-tinted. It soon becomes evident that everyone in this occasionally harrowing drama is woefully short of the full shilling. Baby Rio bursts in to the get-together to bring the first act to a shocking finale. The audience returns to meet Rio’s gang, such as they are. All three are dressed like Daryl Hannah’s Pris from Blade Runner in cheap golden blonde wigs, thick black eye make-up, gold outfits and torn tights. Are they seriously trying to instil fear? In Russell Bolam’s drama they look like sad little rejects from a pop band now playing at being tough. Flood rightly mocks them, even when he is being tortured (which makes for prolonged and uncomfortable viewing). Girl gangs and violence by women are now increasingly common but these three are unconvincing, even when brandishing knives (call that a knife?). The East End has changed out of all recognition since the 1960s and returning to it was probably the biggest mistake made by the now criminal novelist. Veteran stars Feast and Reid are a quality act and their experience shines through. He snarls and wears the suit well. Even though years have passed his “gangster” can intimidate just by a look and the curl of a lip. She has perfected the daft old biddy, her wide-eyes filled with madness. The girlie gang (Florence Hall as pyromaniac Rio, Scarlett Brookes as her lesbian lover Miss Sulphur and Rachel Redford’s psychotic Miss Kerosene) aren’t bright, aren’t terrifying and, after a while, I was glad they wandered off with their box of matches. A promising, funny, uncompromising first act let down by a frustrating second act and a predictable finale.